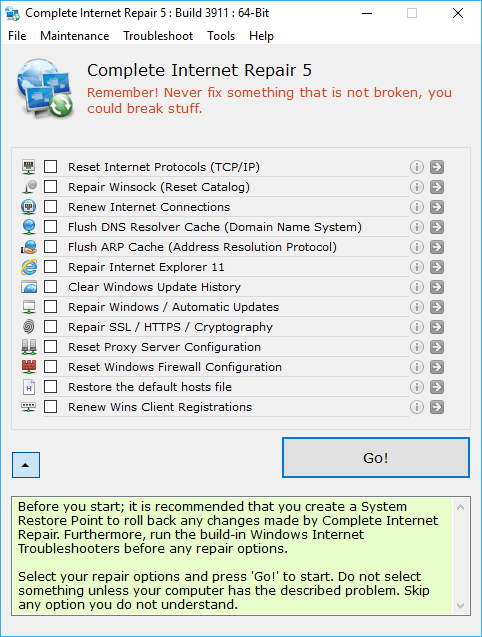 I updated Complete Internet Repair to version 3.0.2.2625. More information and download from: http://www.rizonesoft.com/downloads/complete-internet-repair/ Could you please update the listing on TPFC to reflect all the new information. @Mark3251 This reply is about 5 years late. :-) Yes, Complete Internet Repair can finally reset proxy configurations. I updated Complete Internet Repair to version 3.0.2.2595. More information and download from: http://www.rizonesoft.com/downloads/complete-internet-repair/ Could you please update the listing on TPFC to reflect all the new information. The portable download link is at the bottom of the page. Thank you for publishing Complete Internet Repair, I truly appreciate it. Thank you all for the support over the past 5 years. You rock! To delete your own comments simply click on the little gray trash can icon below the version number. If this icon is not visible to you, your rank is to low to do this presently. I updated Complete Internet Repair to 2.0.8.2082. More information and download here: http://www.rizonesoft.com/freeware/complete-internet-repair.html I am publishing all my freeware under Rizonesoft again. Could you please update the listing on TPFC to reflect all the new information (Including company info and home page). I apologize for all the moving, link and company changes, will try not to change anything again. Thank you for publishing Complete Internet Repair on TPFC, I truly appreciate it. New icon and please update the version number in the title also. As a final note; would it be possible to remove my previous comments, regarding link and company changes. If not, I do understand; just want to keep everything neat and tidy. When you have some spare time, could you please update the information in the listing to reflect the changes. I thank you for your assistance. Current V1.2.8.1283 seems not-quite-stand-alone. From the website "Complete Internet Repair is now part of the Doors system. Download Doors, extract the package and launch GoBar.exe. On the Go Bar, go to Go => Programs => System Utilities and then go to Complete Internet Repair or just launch CIntRep.exe in the Doors folder." Also, their current download hosting is terrible! Download timers, limited number of DL's unless you sign up for "premium" services. Not so happy with Rizonesoft anymore. Does the second option in this program fix the issue I talk about at http://carbonize.co.uk/wp/2009/02/15/system-event-notification-service-not-starting-on-vista/ ? If so I will link to it there as an easier option for people with that issue. I did send Rizone a tweet but not got a reply. Thank you for your support. That was really quick work. Do you check for PROXY server setting?